He was called a saint, an ascetic hermit , a man who doesn’t take money, an angel, a divine stranger, a traveler from the past, a beggar … Few Bulgarians have not heard of Good Old Dobry Dobrev, many are those who do not have the fainest idea of the true holiness of his cause. This year Elder Dobry turned 99 and still continues to give selflessly to the others his only treasure – kindness and humanity. And at this advanced age he can be spotted from time to time throughout metropolitan streets in search of generous people to implement his cause. Elder Dobry has been raising money for decades to restore churches throughout Bulgaria. He is not afraid of cold and bad weather, does not worry that he will remain hungry. He is not angry at people indifferent to his work. The old man radiates kindness and meekness. He is ready to kiss a child’s hand with a smile, dropped a coin into his box , to talk about God with every passerby, to thank for the charity. But Elder Dobry is not a beggar. He does not rely on strangers to save his body, but he wants to save their souls. It can’t be called a beggar a man like him who has forgotten his needs and raising money for lofty mission, far from the material benefits.To donate to the church means to bestow on generations, of faith in a godly future to build a benevolent Bulgarians. This is what Elder Dobry thinks he does without expecting gratitude. He respects people and doesn’t keep anything wrong in himself. He sees the world around him is selfish, but he doesn’t get upset but leaves a trail and gives an example with his donations. So many people worship him.The faith of the man who doesn’t take moneyWe don’t know much about Elder Dobry’s life. He does not want fame and does not want to divulge details of his daily life. It’s enough for him people to know he is a good person who collects money and donates it to the Bulgarian churches and monasteries. He doesn’t think his personal life is more important than his public affairs. The man with the big heart, was born in 1914 in the village of Bajlovo which is known as the birthplace of another great Bulgarian – Elin Pelin. It is tucked away in the west wooded spurs of Ihtimanska Middle forest. Elder Dobry has four children and has outlived two of them. Now one of his daughters takes care of him, although he lives in Sofia. He does not hide his bitterness by false rumors that disinherited his family and has donated the money from the sold property . That’s why he doesn’t share any details about his family any more. . It’s known about his past that his hearing was damaged from a shell which fall nearby. He doesn’t share what prompted him to become a son of a stranger. Maybe the fact that Bajlovo never had an abundance of material wealth or wealthy people. Elin Pelin himself wrote: “It is my native village, it is good but very poor.” Elder, however, made good his birthplace rich spiritually. Since the people from the village can remember, Elder Dobry goes to churches and monasteries around Bulgaria to collect donations and help them. His fellow villagers who see him almost every day are absolutely sure that he donates every penny that has dropped into his money-box. They believe nothing is never left to himself.Modest home for a big soul Elder Dobry’s hause is a few steps away from the house-monument of his fellow villiger Elin Pelin.. Because of the saint from Bajlovo has become a true ascetic for years he left the comfort of his home to his heirs and relatives, he now lives in a small room in a low outhouse in the yard of a rural church of “St. St. Cyril and Methodius”. Although there is a bed, he prefers to sleep on the floor and does not want to use any facilities of the modern civilization. On the table in the modest room there is only a piece of bread and a slice of tomato, but they are enough to survive another day. In the winter cold and uninviting morning he can be seen rolled up the sleeves of an old black coat to carry full buckets and boards around the yard of the church. It is piled with lumber and tools around. The roof repair is now finished, but there is still work to restore the old building. Money for natural regeneration are donated by the good old man. Despite the accumulated years he actively helps in the hard work of another worker. The village church was built by master Gancho Smolsko Trifonov from the village in 1884 and now it is a cultural monument . Recently, however the priest died and another priest from the neighboring villages comes from time to time to do the services. 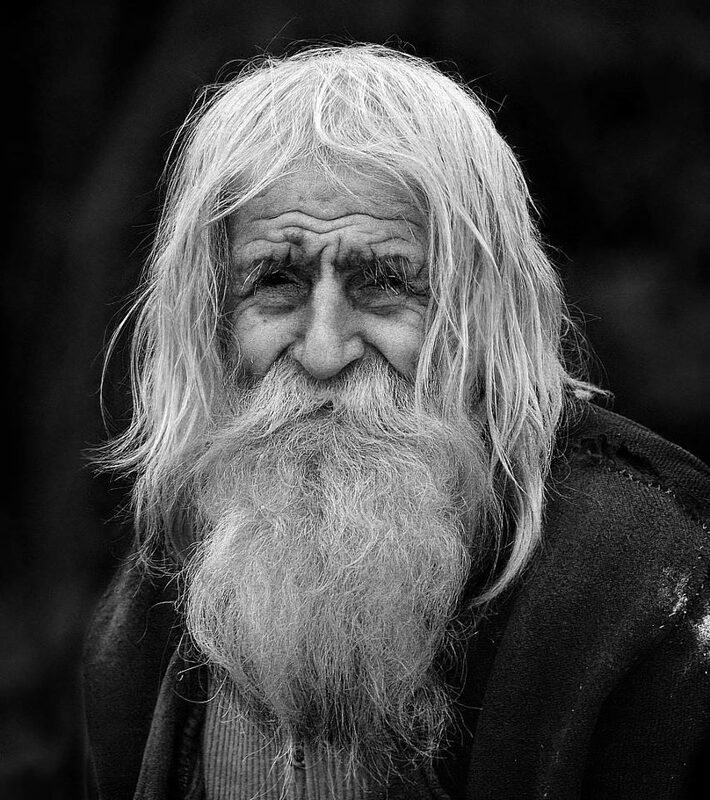 So Elder Dobry opens and closes the church every morning and night.Traveler from the past or … the futureWith his authentic clothes, sandals and homespun clothes, with his long white hair and a beard the grandfather is perceived by many as a traveler from the past. He looks more like the most ascetic saint of the Bulgarian Church St. Ivan Rilski than a contemporary of immorality and corruption. He seemed to come from ancient times in different manners when mercy and faith had a sound basis. Meanwhile, Elder Dodry is a good traveler … from the future in the literal sense and he does not stop jetting between his home village and other places to continue his righteous case in support of the church and spirituality. While he was young Dobry Dobrev regularly traveled the distance from Bajlovo to Sofia on foot. It exceeds 25 kilometers. But he can not rely on his legs and uses a bus. As many know him well, drivers often does not even want him money for a ticket. He often relies on the generosity of passers-by to secure the necessary food for the day. In the summer Elder Dobry is often seen to eat a ripe watermelon. largest contribution, however, which helps to promote the work of the saint from Bajlovo, is undoubtedly for the temple-monument of “St. Alexander Nevsky.” But the unbearable amount of 35 000 lev the good old man has collected for years to be donated to the largest Christian church in the country. This happened in May 2009 when the old man found the secretary of the church board Stefan Kalaidjiev and shared his intention to make a big donation. It turns out that the money, penny by penny was payed in a bank branch in Novi Iskar by a close relative of his.. They went to town and began to enter any office of a credit institution to find out where the donation was kept. Just with one signature the temple received the largest donation in its history. According to Stefan Kalaidjiev ,the average annual amount donated from people visiting the temple is 2000-2500 leva /1 EURO=1,95 leva/. The money is collected primarily around various holidays.The good grandfather donated his money for renovation and covering the throne in “Al. Nevsky” with gold again. New clothes and curtains were bought and a leak was done. As an expression of gratitude some people from the church headed by a preist called Tikhon visited the humble home of the ascetic from Bajlovo and offered their assistance for the purchase of some furniture essentials.The Saint of Bajlovo however refused everything. This is a man who collects virtues, gathers and collects fruit for the eternal life, summarizes the secretary of the “Alexander Nevsky Cathedral. The above mentioned donations are only a part of the famous ones. The rest are available to him, for whose glory it is collected. With the gifts the good Elder gives he can be compared with another one well known but unreal old man – Santa Claus. Elder Dobry does not take the children bears, dolls and trucks but gives them his example, transmits them hope to become a more honorable and spiritually uplifted people. And who does not believe in Santa Claus can believe in the good old man. It means to believe in goodness. Hello, my name is Fr. Deacon Photios and you don’t know me. I’m trying to locate someone there in Sophia who I can pay to obtain something that Dobri Dobrev, the living Saint, has touched. Do you know anyone who might be able to do this? Thank you and God bless. Please email me or find me on facebook. It would be good idea if you contact the webmaster of this website. Today, 13 Feb 2018 of a age of 103 he died. Though he has passed, his holiness and compassion will live on, as he goes to rest in the presence of his Lord.